Thank you for posting this! It is inspiring to know that such a great book can be created in less than three months. I find myself drawing with pens more and more and I actually like it. If only I could draw with pens without making mistakes. (Strangely enough, I make less mistakes with pens.) Do you ever make mistakes with ink in your sketchbooks? If so, do you correct them or do you go in some other creative direction? 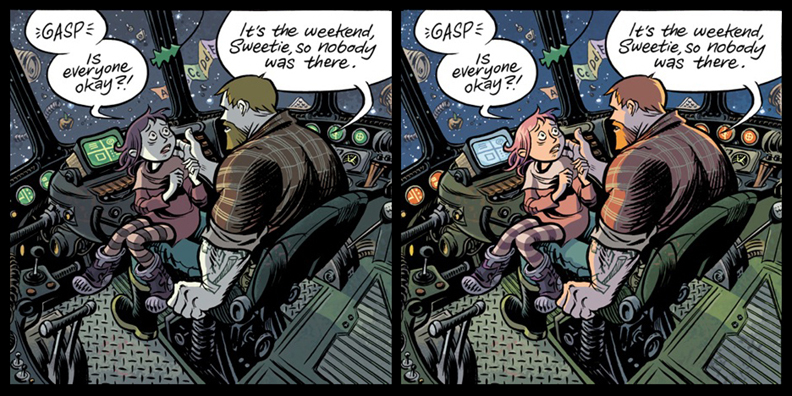 Shoot–that Dave Stewart really knows his way around color! Carnet de Voyage is a really fun book, btw. Would you ever consider putting out a book with your sketches and notes for Chunky Rice, Blankets and Habibi? Is it too soon to do something like that? I love the added warmth and lighting changes in those Space Dumplins frames. It is so cool to see how dramatically the mood changes between the two frames. Dave Stewart’s work really is amazing! Also, congratulations on the Carnet anniversary. There is something so lovely about the loose and unedited quality of that book. It is a perfect match with the content, exactly how a book about a young traveller exploring new territory should be! Hi Craig! Space Dumplins looks great! Carnet de Voyage is a rwallly special book, congratulations!!! I loved your Carnet, Man. I must’ve read it at least 4-5 times, never gets old. rather than the same old contrived stuff. Doesn’t hurt that your renderings, albeit on-the-fly, are still easy on the eyes. hope to meet you one day when I move up to the Pacific Northwest to Cartoon-full-time with the Greats! 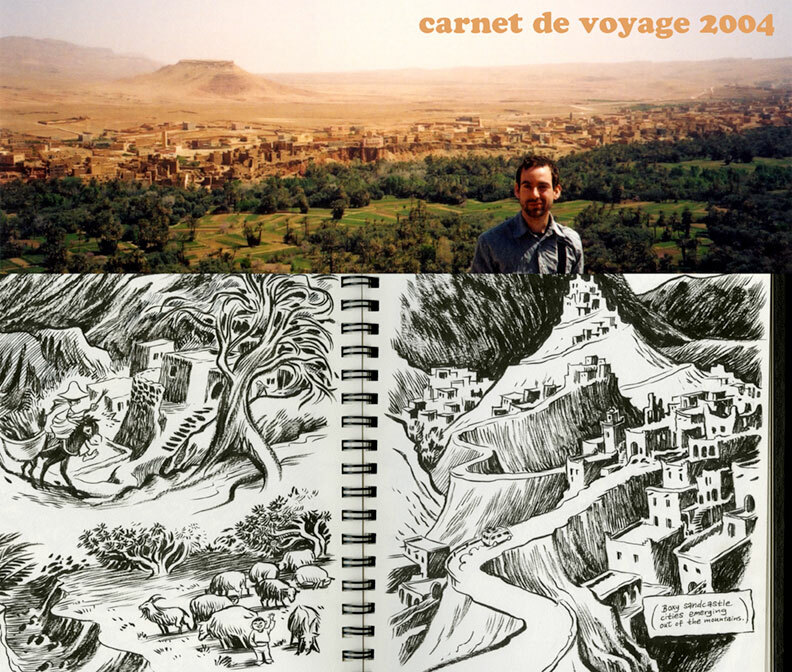 Carnet de Voyage was the book that got me back into graphic novels AND travel again. Thank you for publishing it. I’ve enjoyed your work since “Goodbye Chunky Rice” and am pleased to see that you’re still creating and celebrating beautiful things by means of your pen. Also, I’d like to add that even though it’s been 10 years, you look virtually the same. I know you’ve said this is an “all ages” book, but this makes me wonder if you’re ever going to explore Hebrew in a manner similar to the way you explored Arabic in Habibi, because, based on what you presented in Habibi, there are some interesting parallels between mystic literature on Hebrew and mystic literature on Arabic which would reinforce you’re plea for religious unity/coexistence in Habibi. Anyway, eagerly awaiting Space Dumplings! I love Carnet de Voyage. I tried to do the same, sketching a lot when I went to Japan last year, but I didn’t succeed sadly. Instead I did make a very nice scrapbook with the most random pieces of paper, advertisements, food packaging with the occassional doodle. Better than nothing, right! Space Dumplings is looking incredibly awesome already! Many regards from London, UK! I loved Carnet de Voyage as it always reminded me of my own travels through Morocco- and Space Dumplings looks beyond awesome. Can I ask? Do you ever do sketch/drawing commissions? My girlfriend and I originally met and bonded years ago over a love of Blankets and I’m planning on proposing to her soon…and total long shot: was hoping to commission a sketch of a photo of us together. I just finished reading Habibi! I saw a poster advertising it there in a cafe in Morocco, and after reading Blankets last year, I had to pick it up. I can’t wait to read Carnet de Voyage now. I’ve been an absolute fan of Blankets ever since I read it as a teenager when I was going through a similar separation from my religious upbringing. Despite not being a huge re-reader in general, I find myself paging through my copy of Blankets often, sometimes passing a whole afternoon reliving your story, and find much comfort in your words and drawings. For whatever reason, I’ve never read any of your other works until last week when I picked up Carnet. I was thoroughly enjoying it and developing intense wanderlust until I got punched in the gut a little over halfway through by an aside you made. You mentioned that you had watched a documentary about Renoir while in France and it had featured his son taping his paintbrushes to his hand in his old age. You see, my father was an abstract painter who died unexpectedly about a year and a half ago. He told me countless times that he wanted me to tie his paintbrushes to his hand just like Renoir if that’s what needed to be done for him to continue painting in his old age. I never got a chance to show him that devotion due to his untimely death. To find a reference to such a personal anecdote had me in tears. You once again managed to find a very special place in my heart and my bookshelf. I’m very much looking forward to continuing reading through your material.